We Offer Tall Ship Sails. Sailing provides many adventures and dreams. You may sail a modern sloop or a maxi racing boat, however, not many of us sail daily on a tall ship but all sailing evokes a wistful dream of adventure and discovery ever time we board. Sailors who do grip the rigging and command the power of tall ships rely upon the strength and dependability of Lee Sails. The Lee Sails loft canvases tallships around the world, using only the finest modern sailcloth to provide dependable power and shape, excellent UV resistance, durable chafe defense and detailed finishes as keen as the saltiest Cape Horner. Lee Sails will construct each sail to the specification demanded by your sailing vessel, large or small, be it a paneled topsail, cross cut main sail, vertical cut gaff sail, miter cut staysail or jib. 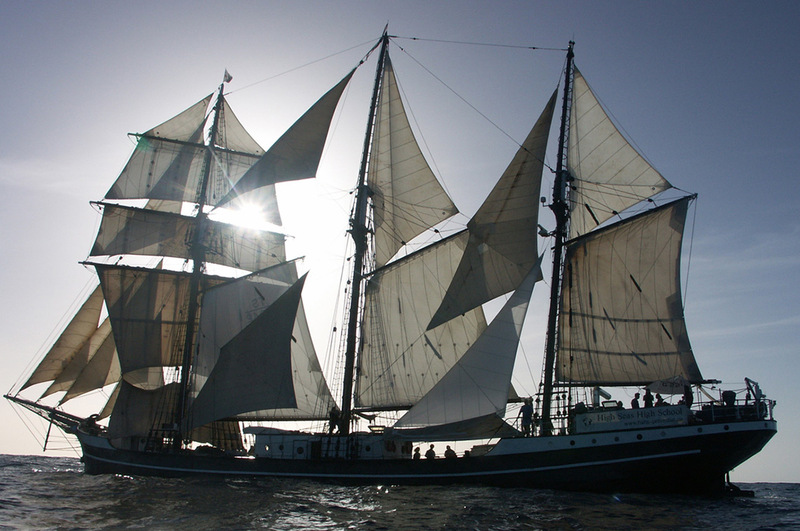 The Lee Sails lofts' sixty years of experience has made it a major choice for custom tallship sails. Lee Sails are all constructed with triple stitching, double folded tapes along leech, tack and clew reinforced with heavy webbing, pressed and sewn grommets, bolt roping and leather chafe reinforcement. A selection of sail hardware for grommets, D-rings, maxi ring, pig ears, reef points and stainless steel tack rings are all available. Every finished sail is given a unique identifier and remains on file with the Lee Sails loft to provide consistent documentation and accurate replacement when timely. Our large sails come standard with triple stitching on panel seams, and a two years guarantee. Any of our knowledgeable agents in Canada and in the USA would be happy to assist you. Please complete our quote request form or contact our head office. The Lee Sails loft would be pleased to provide a current list of our tallship customers and references, if requested. www.leesailsdirect.com is the exclusive distributor for Canada and Eastern coast of USA for Cheong Lee Sailmakers Ltd "Lee Sails" with head office in Hong Kong.